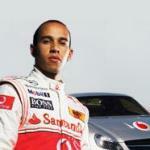 Vodafone has announced the “Hot Laps with Lewis Hamilton” competition for its customers. Winners of this competition will get a once-in-a-lifetime opportunity to experience the exhilaration of being driven by Vodafone McLaren Mercedes driver Lewis Hamilton in a SL 63 AMG Mercedes on the picturesque race track of the Madras Motor Sports Club on September 17, 2010. This is going to be Lewis Hamilton’s third visit to India, enthralling Vodafone customers with cricket fever in Delhi in 2009 and karting mania in Mumbai in 2008. In order to participate, Vodafone customers have the option of either answering questions through a SMS based competition or by posting the fastest time in an online competition being run on the Vodafone India website. In the SMS competition, customers need to SMS LEWIS to 56565 (toll free) and answer five simple Formula 1 related questions. Six winners will be picked from Mumbai, Delhi, Hyderabad, Kolkata, Bangalore, Chennai and two from rest of India, respectively. Customers can also participate in an online racing Game Hometown GP on www.vodafone.in to win a hot lap with Lewis. Last date for entries is Monday, September 13th, 2010. Vodafone and Radio City presents Dekho Visarjan Aasman Se! !